The Bob Welch most folks recollect threw fastballs in the high 90s. Welch would rear back and the ball would come out of his hand already spitting sparks. Halfway to the plate you’d testify in court that it had a comet’s tail. It was an iconic moment in game two of the 1978 World Series. It was Jackson’s Yankees taking on the Dodgers. Welch was a 21-year-old rookie out of Eastern Michigan University called into the game to protect a one-run lead with one out in the ninth inning. He got Thurman Munson to fly out before facing Jackson, one of the game’s most feared power hitters. The at-bat lasted more than five minutes. Welch threw nine pitches and all of them were pure, unapologetic heat. There was no indecision in his approach. On a 3-2 count, Welch scorched the inside corner. Reggie swung and missed and the Dodgers won. Welch, who won 211 games in 17 major league seasons from 1978 to 1990, died Monday in Seal Beach, California, of a heart attack. He was just 57. Welch, who grew up in Ferndale and attended Hazel Park High School, was named to All-Star teams in both the American and National leagues, and won the American League Cy Young Award in 1990. That’s strictly the national recollection. But folks who knew Bob Welch from back home in Oakland County, have other memories. What I remember about Bob was that he was always happy to come home to Tiger Stadium. He was always so good to the fans in Detroit and had time to sign a few autographs. But what I most remember was the day (near Christmas) he walked into my volleyball practice at HP and ask if he could do some throwing at the other end of the gym. Of course I said yes! After he was finished he walked up to a couple my Varsity VB players and asked them if they would teach him how to serve! He told the girls that he had moved to California and he thought he better learn how to play VB. Needless to say my girls were very excited to teach him. I know he took the time to talk to students at HP about his life. You will be missed Bob, especially in HP. It was in June of 1974 when Bob Welch graduated from Hazel Park High. Greg Esler is a ’73 Hazel Park High grad. Esler has known plenty of quality athletes. He’s a Hall of Fame high school basketball coach who has been at De La Salle in Warren since the late 1990s. Prior to that, he won a state championship in 1994 coaching at St. Clair Shores Lake Shore. Esler has won numerous league, district and regional championships as well. He has more than a handful of NCAA Division 1 athletes. Bob Welch never turned his back on his childhood. Not when he came back to play at Tiger Stadium years ago. Not just four years ago when he returned to play in a golf outing for Greg and Rhonda Esler’s deceased son, Doug, who died in an ATV accident when he was just 15. 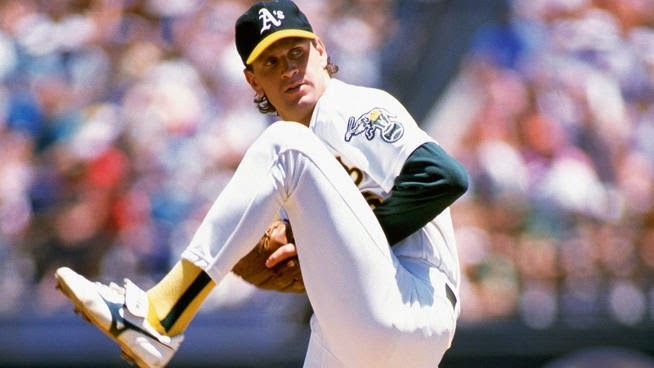 Bob Welch had his best season in 1990 when he went 27-6 for Oakland. That was his Cy Young season. It was the most wins for a pitcher since the Phillies’ Steve Carlton won 27 in 1972. The last time anyone won more was when Denny McLain won 31 in 1968 for the Tigers. Welch ended his career with a record of 211-146 and an ERA of 3.47. He struck out 1,969 batters and walked 1,034 in 3,092 innings. He had 28 shutouts and 61 career complete games. Not all of his successes came on the mound. In his 1981 book, “Five O’Clock Comes Early,” written with New York Times sportswriter George Vecsey, Bob Welch described his struggles with alcohol. It was one of the first times a pro athlete openly discussed a drinking problem. Bob Welch had the courage to face his problem, just like he faced Reggie Jackson and countless other hitters during his career. He won that battle, just like the one in the second game of the World Series in 1978. RIP Bob Welch. Your home town is proud of you.